The Aeroflex 3500 is a portable RF testing set that combines the features of the bench-top test set with an excellent field capable unit. Its long portable battery life enables users to carry out measurements for up to 7 hours when required in isolated settings. The rugged design features include a weatherproof casing that allows for use in many diverse field environments. It is capable of testing a variety of transceivers, and can also test virtually any component of a radio system, including both antennas and cables. The 3500 is a powerful, rugged radio test set and can be used and for a wide range of field testing exercises. It is ideal for testing radio systems which have operation frequency ranging between 2MHz and 1 GHz. 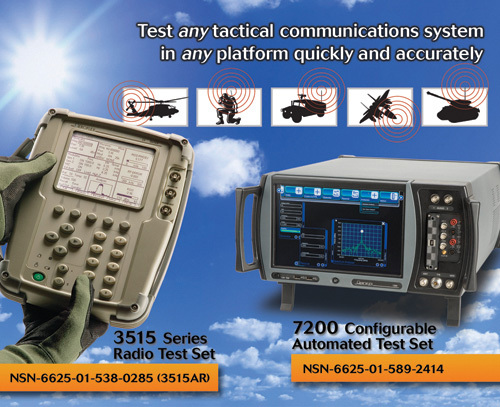 The advanced technology offers support of both AM and FM tests for transmitter and receiver testing exercises. The 3500 test set features a spectrum analyzer and an oscilloscope. With a noise floor of -136db, its analyzer finds numerous applications in the field. Lightweight and portable it weighs just 8 lbs. Built with durability in mind, The Aeroflex 3500 is durable and can operate in the -20oC to +50oC temperature range. This wide range allows users to apply the equipment in nearly all testing environments. It meets the required design specifications for altitude, humidity, vibration, and shock and its reliability is field proven. Its 3.2.0 release features an enhanced user interface, improved save/recall operation, and an oscilloscope option. The 3500’s unique capabilities enable the tester to perform numerous field tests with high precision. It allows precise RSSI measurement, and also operates as AM/FM modulation meter. It can easily support high power measurements without external attenuators. 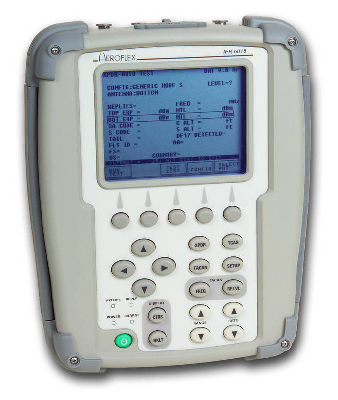 For AF testing, the 3500 has both modulator and generator capabilities, and allows users to rapidly carry out various RF testing exercises utilizing the unique Frequency Error Meter capability. The Aeroflex 3500 is also suitable for Distortion and SINAD measurements. It’s a very capable DCS Generator, and also has Audio Frequency Counter capability. For testing exercises that require Distance to Fault, Return Loss and VSWR measurements, the 3500 test set meets or exceeds most any user requirement. The test set is also designed to allow users to accurately measure the cable losses. With the oscilloscope option, you are able to view and evaluate audio from both RF signals and the radio system undergoing testing. Its markers are designed to enhance audio signal analysis. The new release supports a variety of software tools, and this enhances acquisition and analysis of signals. It also improves signal strength display in various testing environments. Also, the Field Test 6 enhances indoor signal measurements and analysis. The radio test set is also ideal for measuring and displaying various signal parameters. The technician is able to precisely measure and display VSWR, Return Loss, Distance to Fault, and Cable Loss. These capabilities also enhance radio system analysis of both antennas and cables. Please contact us for a quote or for more information on the Aeroflex 3500. This entry was posted in Site News and tagged Aeroflex 3500. Bookmark the permalink.